Research has repeatedly shown that referred customers close faster, buy more, and stay longer than non-referred customers. According to one study, 83% of satisfied customers are willing to refer a product or service, yet only 29% actually do. What if we gave you the secret formula - specially customized for your company - to close that gap and start generating more referrals? From high-level strategies to tactical methods, our relationship marketing experts share their formulaic approach to referral marketing success. 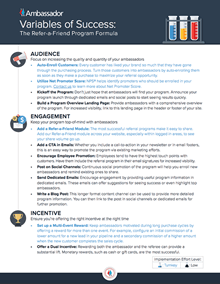 Successful brands are using these best practices to optimize their programs resulting in quality over quantity when it comes to referral marketing. Enter your information to receive your custom formula for referral marketing success.